The suction lance is installed at the lower end of the suction hose. It fixes the hose in the tank. This is particularly useful when there is a stirrer in the dosing tank. At the end of the suction lance is a foot valve with filter mesh. This protects the suction line from large particles and contaminants. Suction assemblies are available with or without level monitoring. The level switch signals the liquid level of the storage tank. In one-stage versions it transmits the signal when the tank is empty; in two-stage versions it also issues a warning before the tank is empty. Suction assembly without level switch comprising a support pipe, foot valve and threaded connector. The length L of the support pipe can be adjusted (shortened) by the customer. 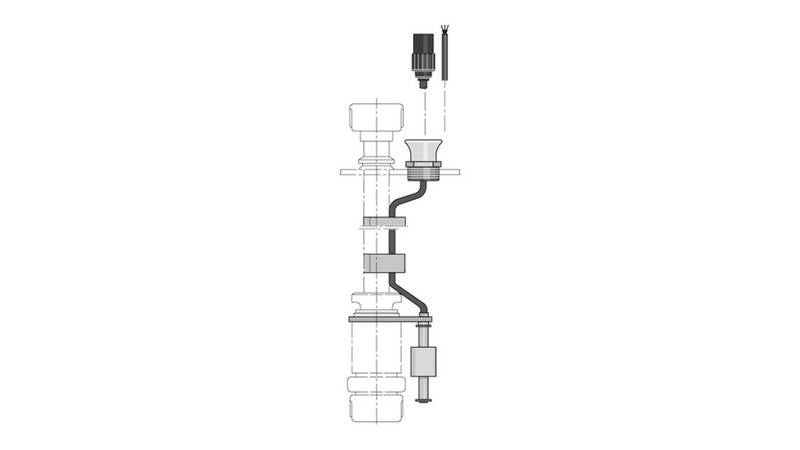 Note: In applications with a hose, the suction assembly/hose connector kit, consisting of a PVDF screw-in nozzle and a PTFE composite seal, can be used. Important: The product contains connections bonded with Tangit. Always note the durability of Tangit adhesive. Two-stage level switch for level monitoring in the storage tank with pre-warning alarm message and switch-off of the metering pump after a further 30 mm reduction in level. With 3-pin round connector for direct connection to metering pump or with 3 leads, e.g. in conjunction with relay control, order no. 914768. The level switch kit can be ordered in conjunction with the DN 10 to DN 32 suction assemblies. Customers are responsible for fixing. 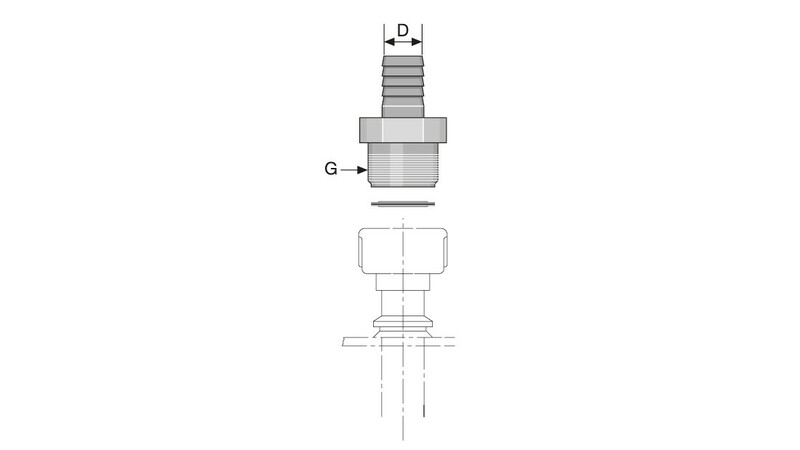 The level switch kit can be ordered together with the suction fittings DN 10 - DN 32. For level monitoring in the storage tank, two-phase with pre-alarm signalling and deactivation of the metering pump after a further level decrease of 30 mm. Body level switch PVDF, float PE, mounting strap PVDF, cable bracket PE, anti-kink device PE, cable PE. 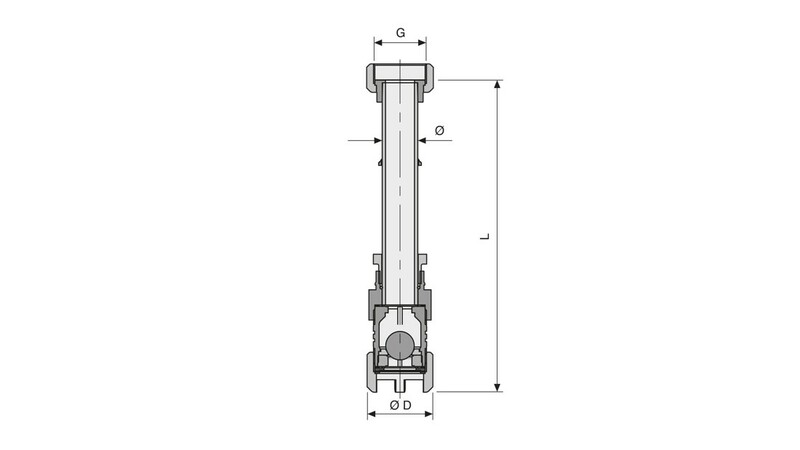 Universal suction lance made of PP in 4 sizes for use in canisters, barrels or containers. 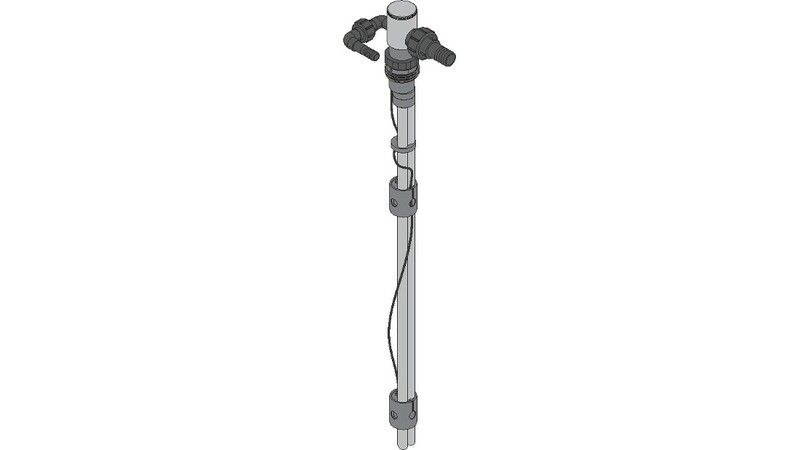 The suction lance is configured as standard with return, ventilation function and 2-stage level monitoring. The height-adjustable level switch and tank threaded connectors ensure flexible adaptation to the process or storage tank height. In addition, the suction tube length can easily be shortened by the customer. A PTFE check ball is incorporated and prevents the suction line from running dry. With IBC container suction lances (1039399, 1046672), the screw lid DN150 can be installed by the customer onto other G2" vent openings. Note: Special designs are available on request. The suction lance is supplied with all additional parts in cardboard packaging. Material version: PP with EPDM seals. Suction connector is not supplied ready mounted. Fittings and pressure hose nozzles in DN 10, DN 15, DN 20, DN 25 (not for canisters) plus FKM seal do form part of the scope of delivery. Return connector is not supplied ready mounted. Fittings and pressure hose nozzles in DN 10, DN 15, plus an FKM blanking plug and seal do not form part of the scope of delivery. Level: In drum and tank lances the level switches are protected by tube pieces. The lance level output is in the form of an M12 plug. Please order the level signal cable for connection to ProMinent metering pumps or a PLC or terminal box separately. *Replace the screw lid when using FDA containers. 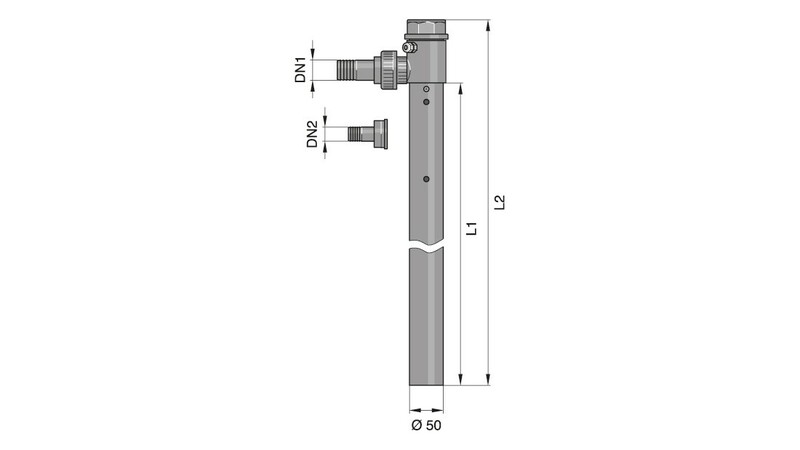 Suction lance with two-stage level switch in PVC protective tube Ø 50 with non-return valve in DN 10-DN 25, flap valve in DN 32 (valve is not removable). For sizes DN 10/15 and DN 20/25, connector components for both sizes plus a dummy panel for the return line are included in the scope of supply. A return line is not possible for suction lances of size DN 32. Barrel suction lances are fitted with a barrel lid. The 2-stage level switch is wired to the terminal in the head. Level sensor cable must be ordered separately. Note: Special designs (materials, functions, Dytex adhesive etc.) are available on request. Please note: The product contains connections bonded with Tangit. Always note the durability of Tangit adhesive.